First a big regret. 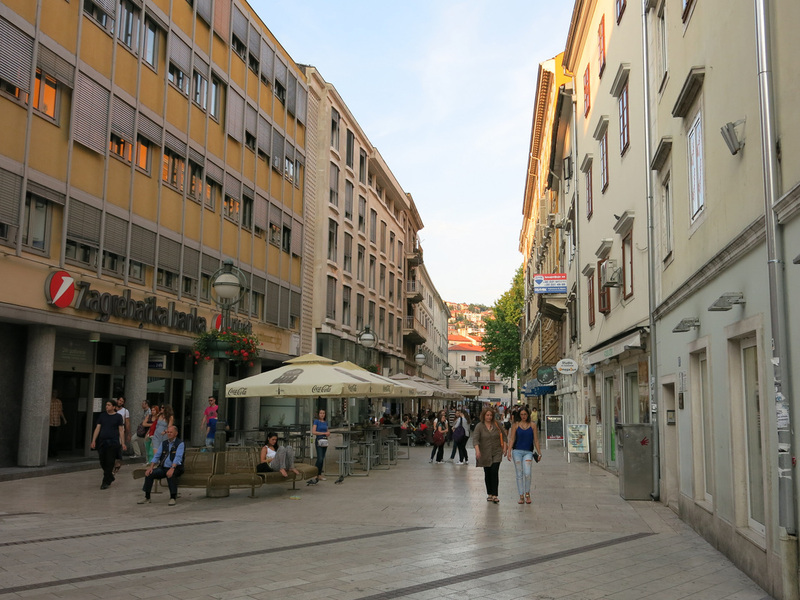 I should have rented a car in Split and driven up the coast to Rijeka. The bus ride passed several towns and small rocky beaches hidden in small coves. Each time I thought about hopping off the bus to explore. The last town seemed to be the best - it was below as we made a 180 turn above a mountain ridge. 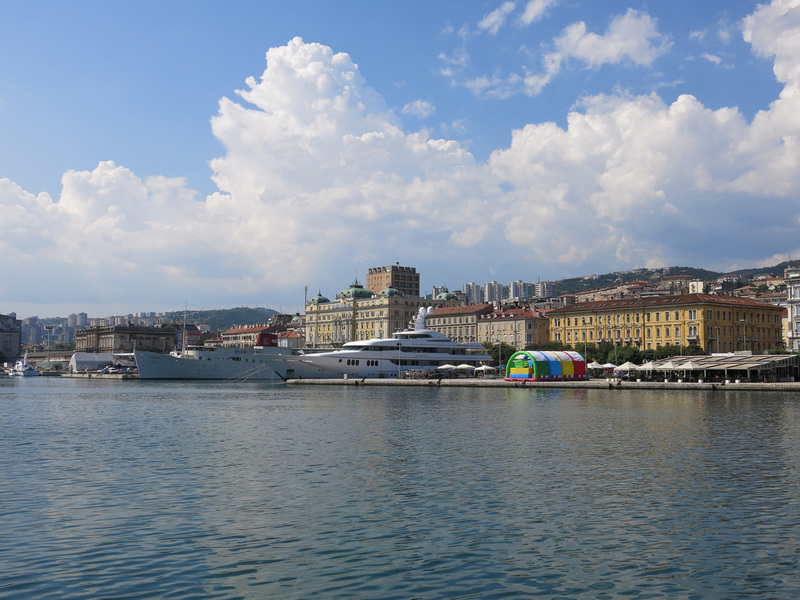 Rijeka was a pleasant surprise. No Old Town area. Not much to offer a tourist, except if you don't want to see other tourists. 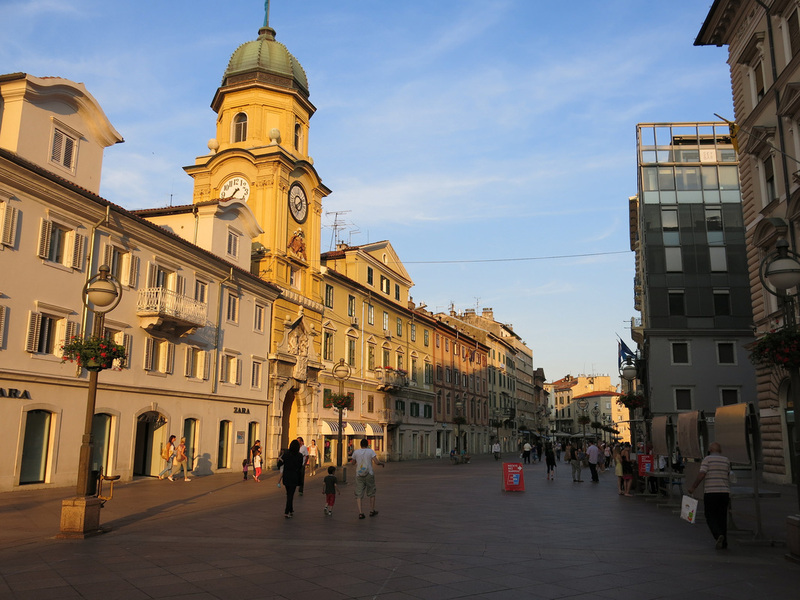 A block off the waterfront was a cafe lined pedestrian walkway with some Italian influence. In the evening musicians played on a center stage. Despite all the cafes there was limited dining options. I found one of the best cafes I've my travels a few blocks away. During the day there's a lively local fruit and meat market near the pier - a good place to pick up some produce before heading off shore. 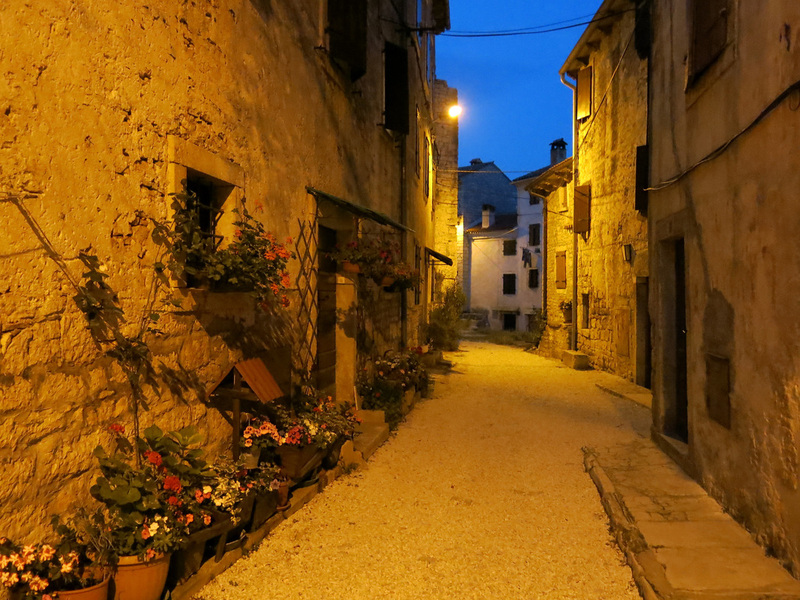 I rented a car and drove through Istria. 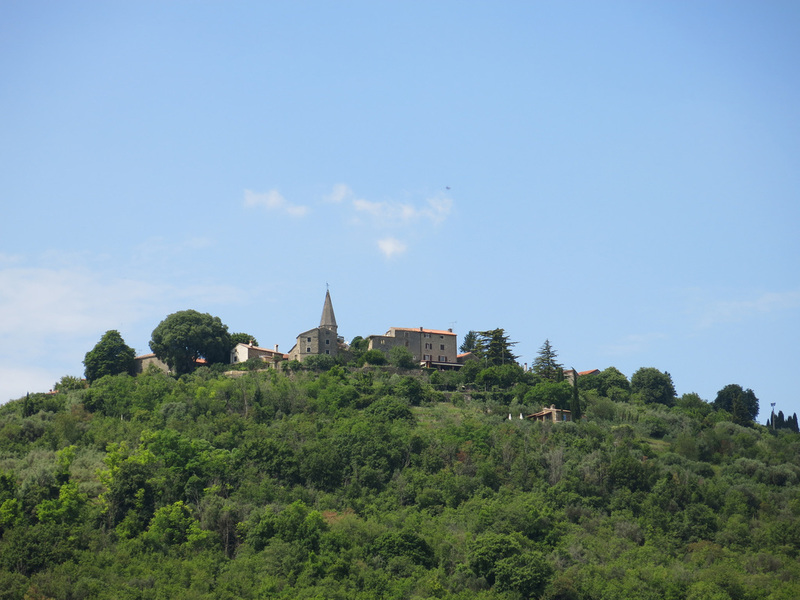 Istria features several medieval mountaintop towns with other old towns along the coast. 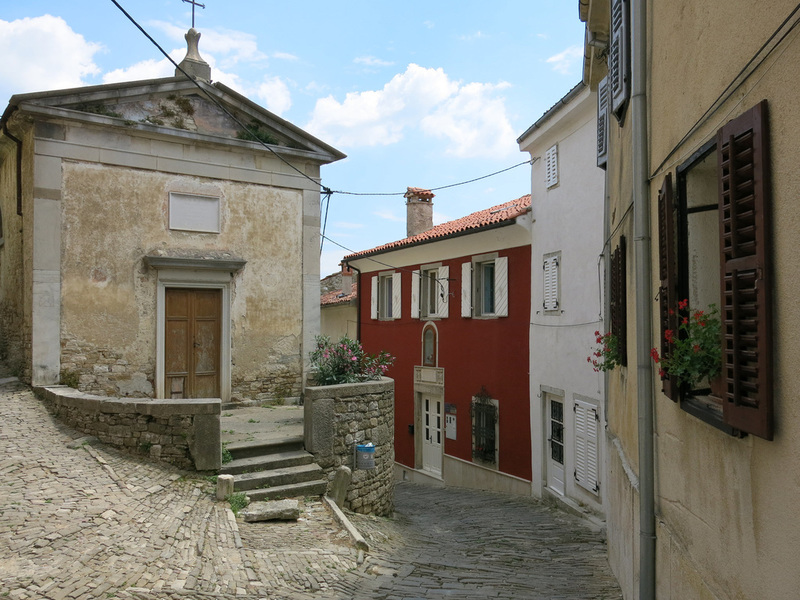 Most itineraries feature Motovun, Grojznan, Bale, and Rovinj. I went searching for “undiscovered” villages and came away disappointed. 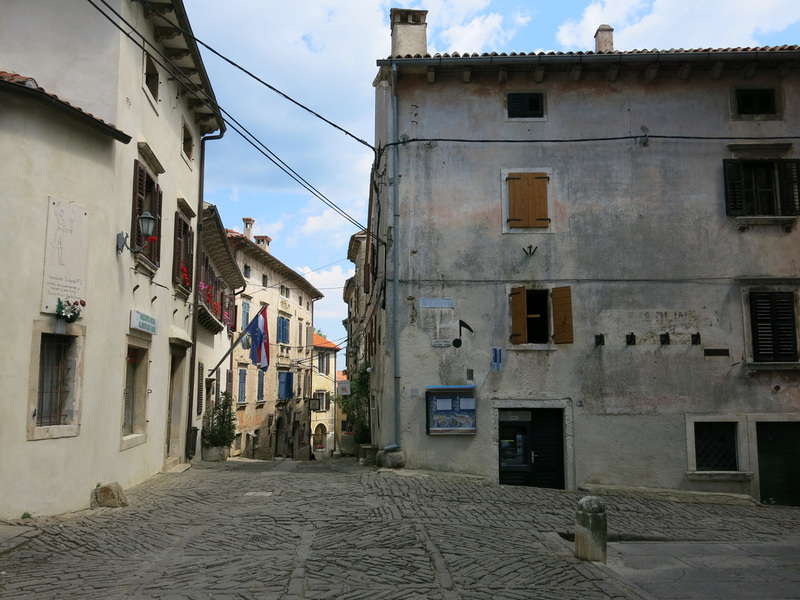 I took a longer route to Motovun, heading first to Pazin, then north from there. The small towns I passed through had an historical core - albeit very small - however, the core was surrounded by modern (or at least new) homes. Motovun is stunning. The approach from the south features the medieval mountaintop village in all its glory. A church sits on the peak with homes winding down the mountain. There's is a 20 KUNA parking fee and then a one kilometer hike or a 20 KUNA round trip shuttle bus to the top. Motovun isn't touristy, however, there are a lot of tourists here. At the top a group of students and grey hairs were wandering the cobblestone streets. Konoba Mondo is a relatively famous restaurant that sits right outside the city wall. 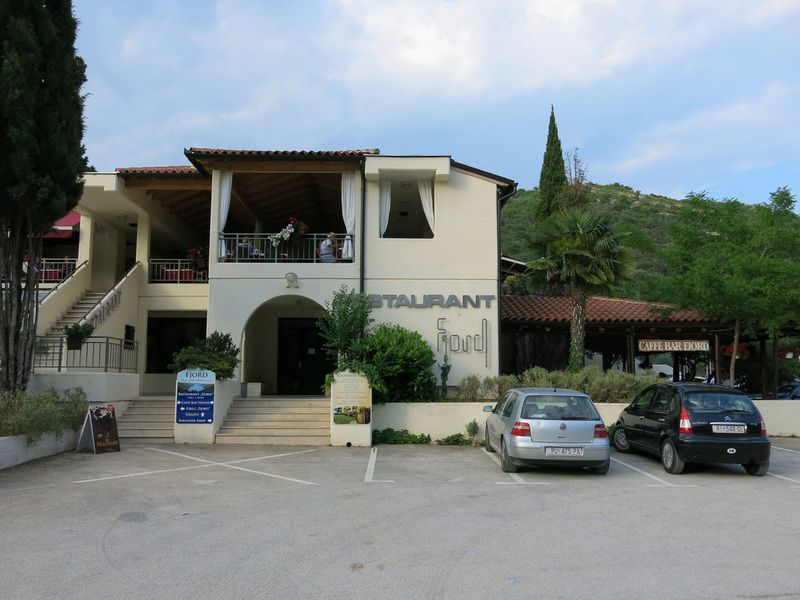 The restaurant received a brief profile in a 2009 New York Times article, then was featured on Anthony Bourdain's No Reservation Croatia episode. 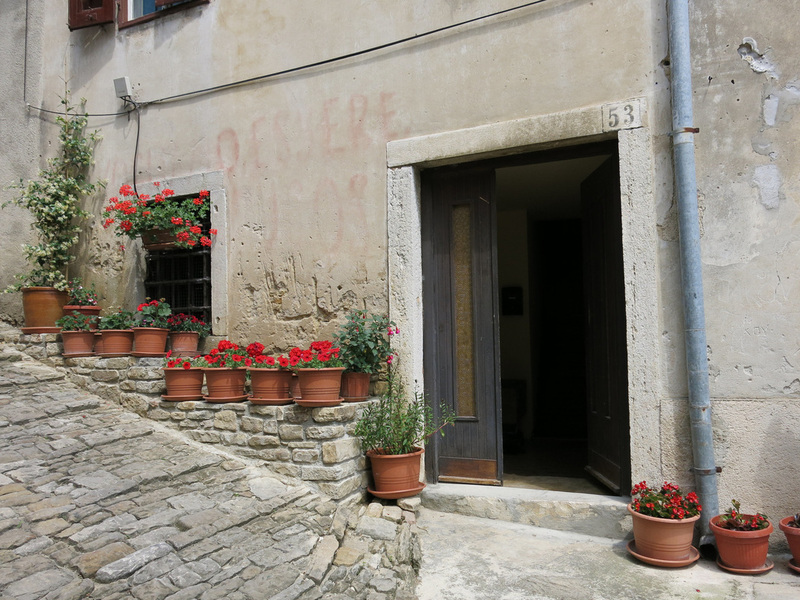 This area of Istria is renowned for their truffles and Konoba Mondo is one of the best place to give this delicacy a try. I ordered the tagtalione with black truffles. I had unrealistically high expectations that this would be one of the best meals ever - the meal was very good but not anything life changing. 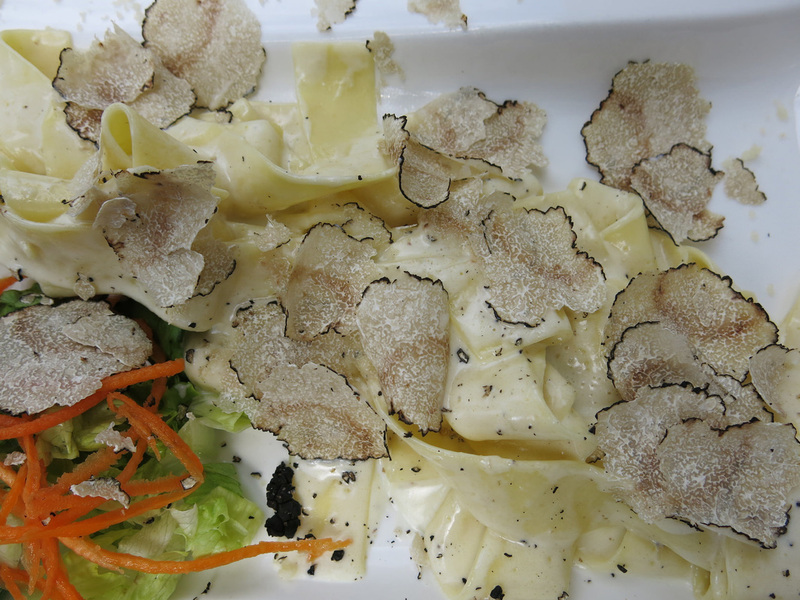 I wish I was better at describing taste - the thin slices of truffles were strong and made the dish a little sweet. I took a different route back down, walking through the residential area, to the parking lot. Fifteen minutes away is another mountaintop village, Grozjnan. I'm starting to see a pattern with the town setups - a church site at the top, there's a defensive wall, then the town spirals down the mountain below. 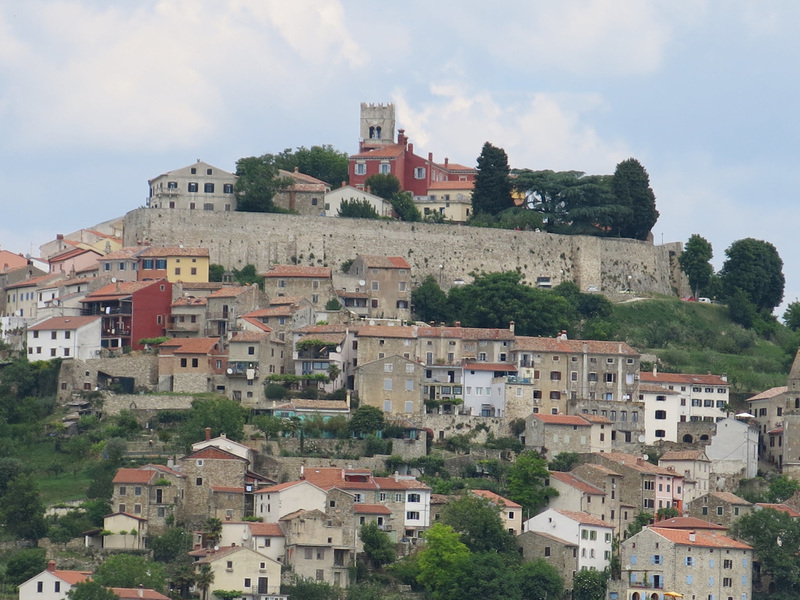 I think the elevation has helped Motovun and Grozjnan to preserve their medieval feel. Other towns I passed were at a lower elevation making it much easier for new construction to spring up around the historical area. 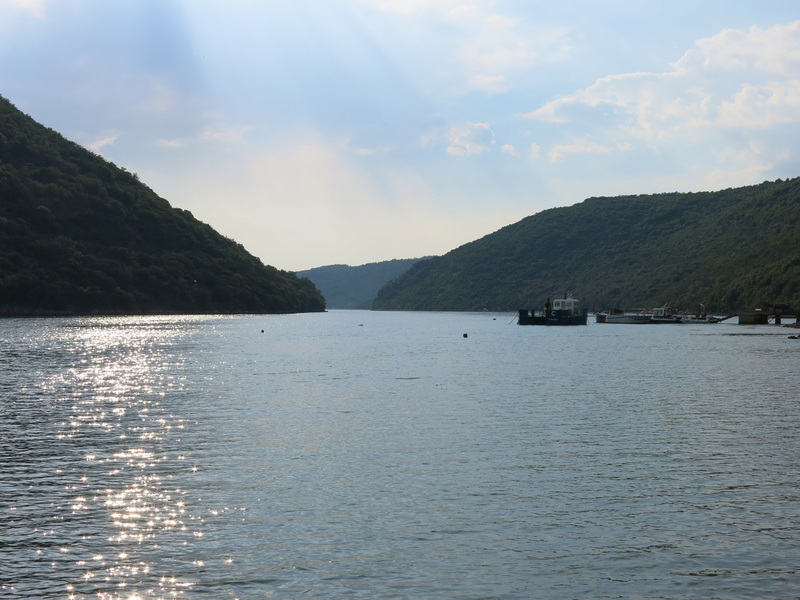 Grozjnan is a bit smaller, has fewer tourist, although feels a bit more built for tourism. There were more bed and breakfasts, art shops, and boutique clothing stores. I did a quick loop through the town and along the wall on the backside. From here I headed to Novigrad a sea side town. 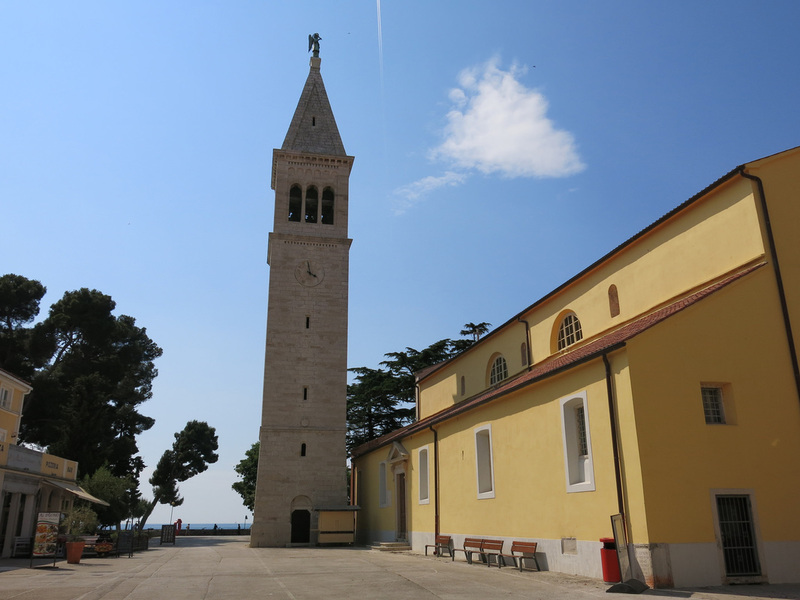 Novigrad has a historical area that leads to a church along the sea. I found a seat at a cafe with a view and ordered a chocolate cake. 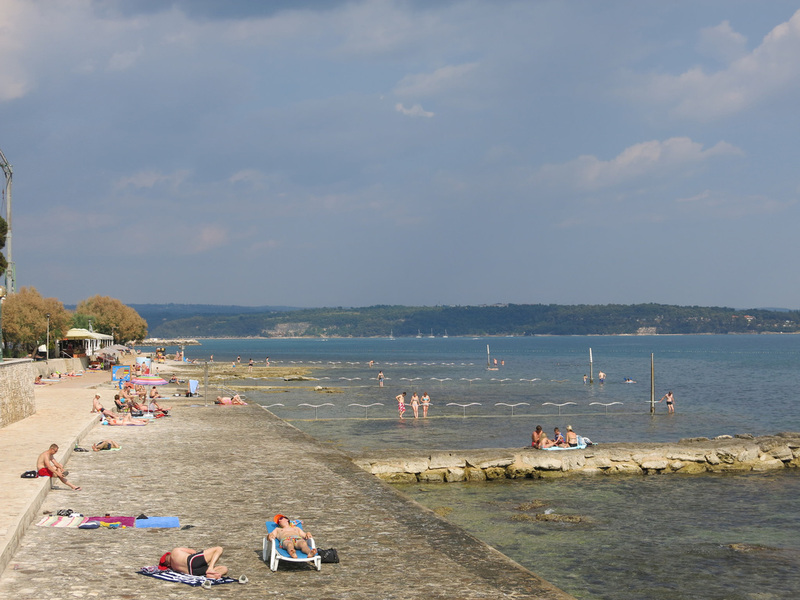 Novigrad did not seem to have any beaches but that didn't stop people from sunbathing on the concrete dock and jumping into the water to cool off. 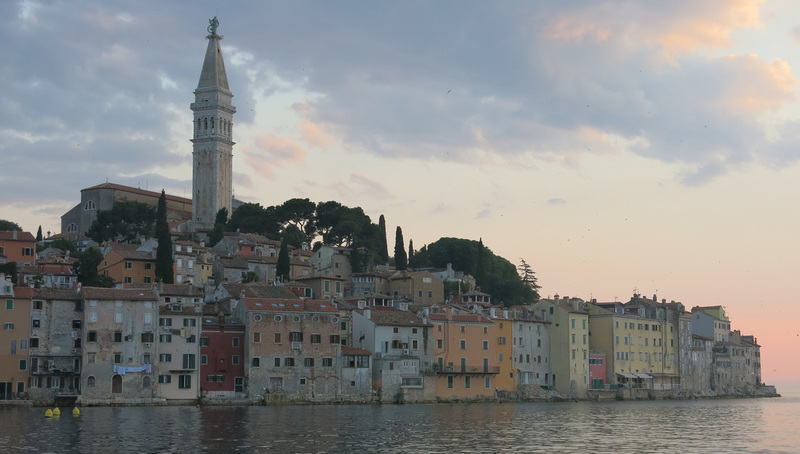 I made a stop at the end point of the Lim Channel on the way to Rovinj. 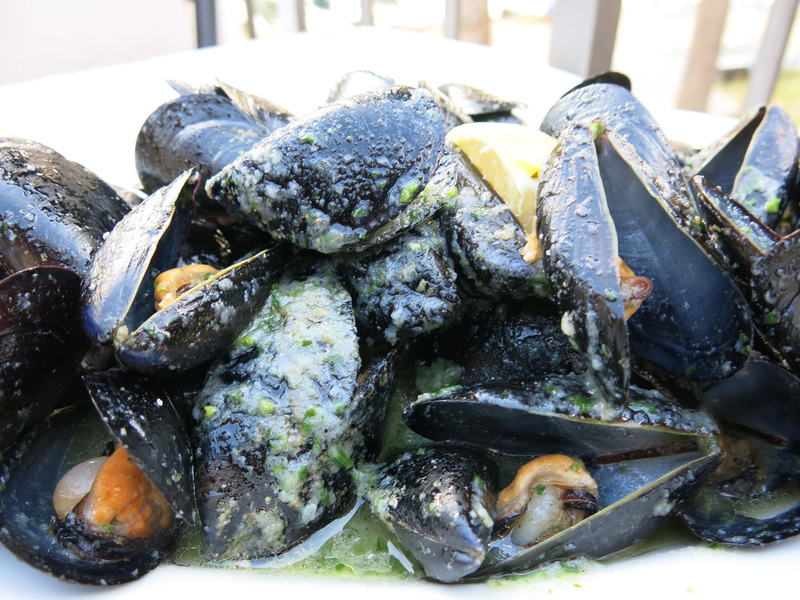 In addition to truffles the other culinary must try dining experience is mussels. The Lim Channel waters are pristine and calm making for an ideal mussel harvesting environment. I hesitantly grabbed a seat at The Fjord Restaurant - I wanted a hole-in-wall, dine on the docks, experience, and The Fjord is somewhat upscale. No complaints or second thoughts once the mussels arrived. It was a huge serving in a thick garlic sauce. The mussels were not as meaty as those I had in Belgium years ago, although the sauce and dish as a whole was better. I ate the mussels as quickly as I could pull them out of the shell. 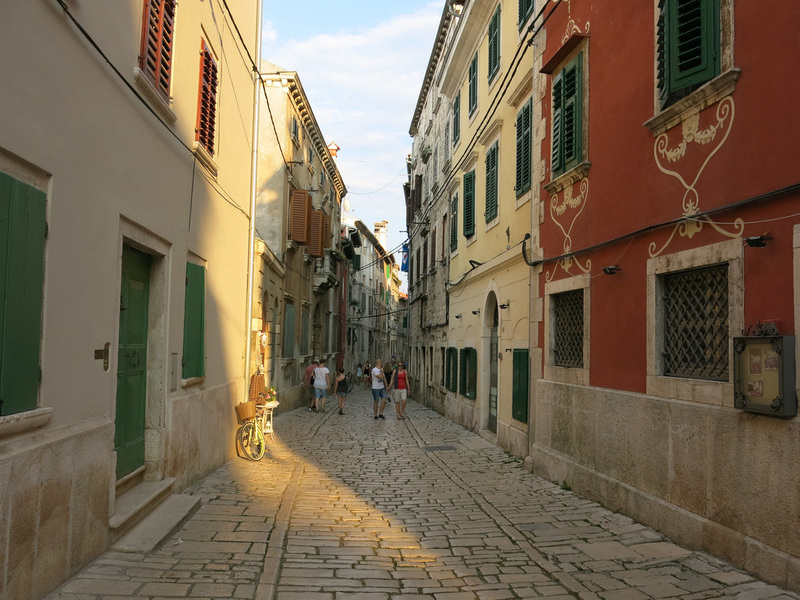 Fifteen minutes later I was parked in Rovinj and walking through the city's Old Town. I followed the spiral pathway to the church at the top then zigged and zagged my way back down. 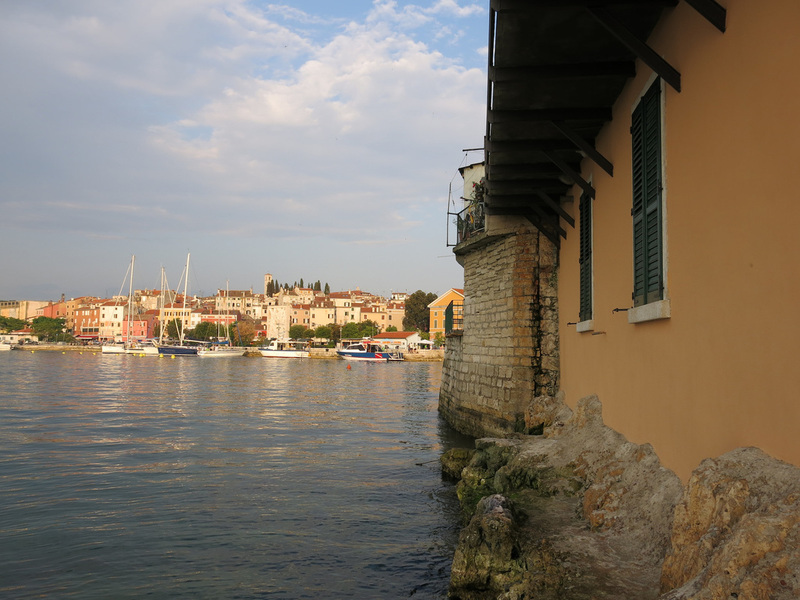 Rovinj was crawling with tourists and I was a bit surprised a I hadn't run into more earlier in the day. 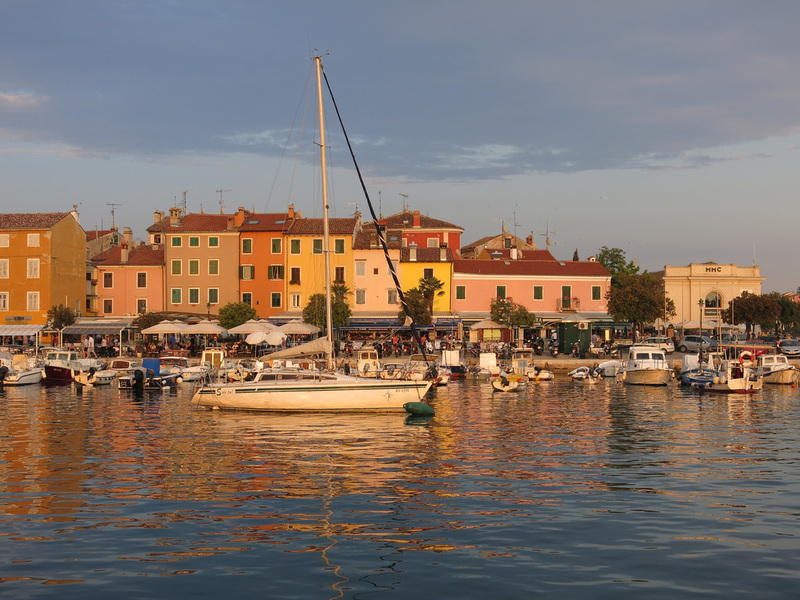 With its location on the coast, Rovinj is an ideal place to watch the sunset. I grab a seat on the peir and watched the waterfront homes change shades as the sun set. I became a little lost on the way to Bale, my final destination. There are several huge trailer park fields south of Rovinj. Most of the trailers seemed to be semi-permanent residences and did not indicate people passing through for a night or two. Back on the correct route I reached Bale just as it was dark. 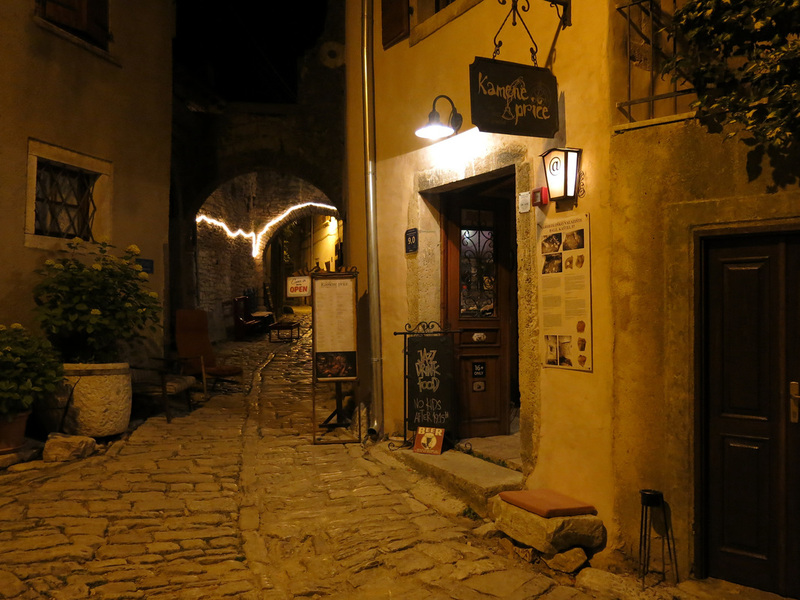 Street likes mystically lit up the cobblestone streets. I circled through the old core and grabbed a seat at Kamene Price - a hotel / bar / all around awesome spot. Easily one of my favorite travel drinking experiences. The town was empty except for me, my beer, and a few black cats.